The Mercedes-Benz Vision A concept which was unveiled at the 1993 Frankfurt Motor Show was a revolutionary design for a company more accustomed to producing luxury barges for wealthy clients. 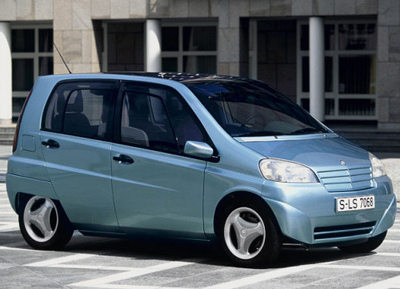 The Vision A was designed to ready the public for a new range of more affordable Mercedes-Benz models. The car itself was a triumph of packaging. At just 3.1 meters long - slightly larger than the original MINI - the Vision A was incredibly compact from the outside. However on the inside it offered a similar amount of room as the Mercedes E-Class! 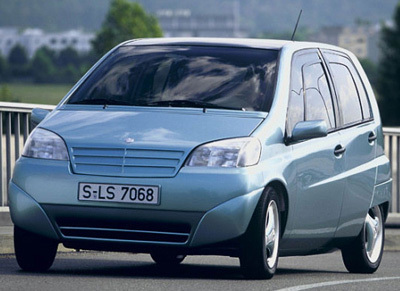 The Mercedes Vision A wasn't a pretty car however, and this was partly due to the problems associated with trying to jam in all the luxuries Mercedes owners are used to, into a significantly smaller vehicle. It had a high roofline and boxy lines designed to maximize interior space. The interior of the Vision A could be configured in a variety of manners, and the rear seats could be completely removed to offer more cargo space. The Mercedes Vision A was powered by a hybrid drivetrain which was made up from a 75 horsepower 1.2 litre engine working in conjunction with a 54 horsepower electric motor. 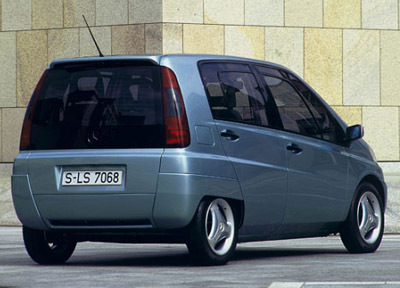 The Mercedes-Benz Vision A concept eventually led to Mercedes producing the A-Class production car starting in 1998. This popular vehicle offered Mercedes ownership but at a fraction of the price. The A-Class is also far better suited to city driving than its larger brothers.